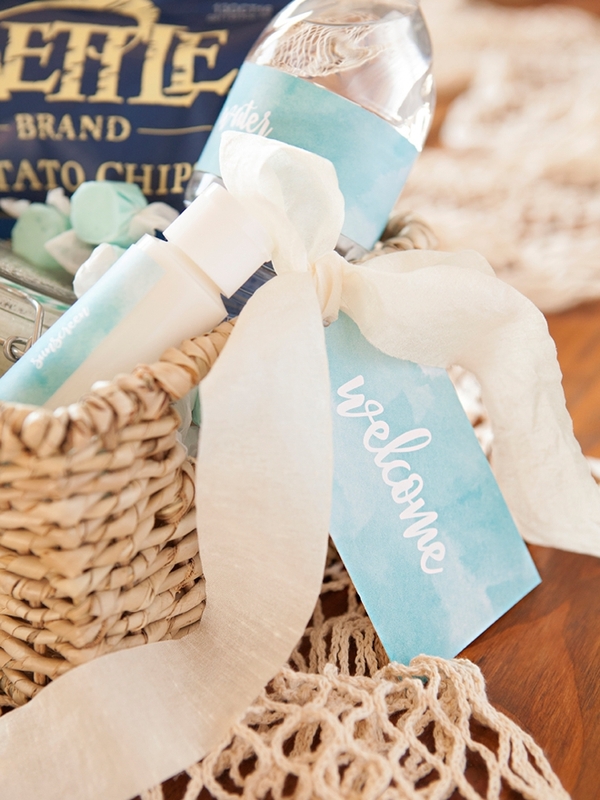 The Anatomy Of A Wedding Hotel Welcome Gift! 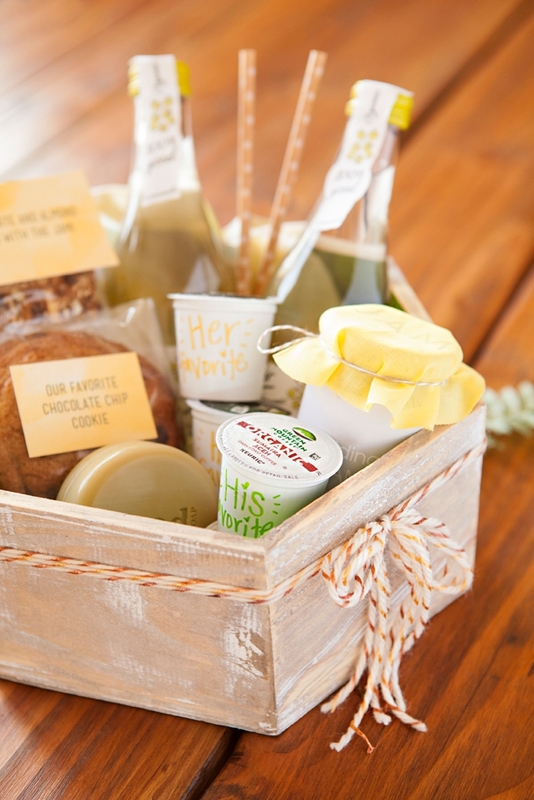 Today we’re talking about how to welcome your loved ones into your wedding weekend with creative style! 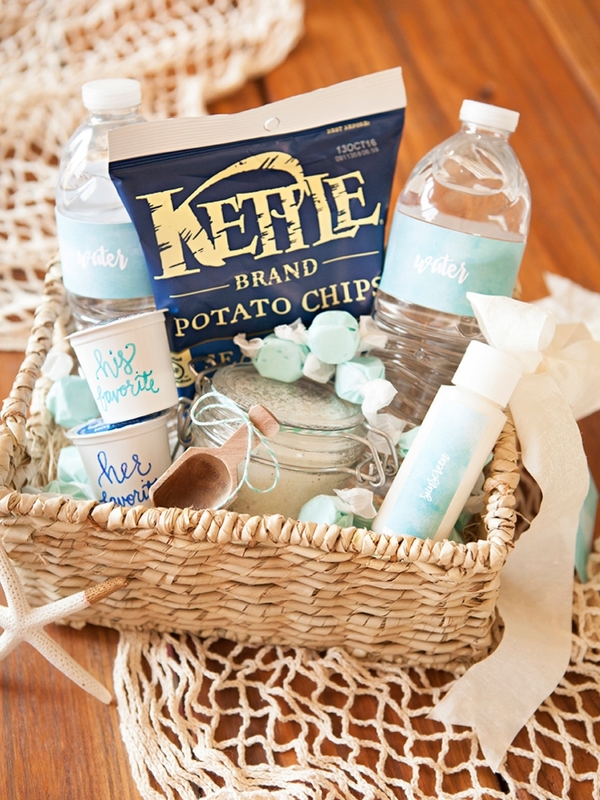 I personally had a destination wedding and since my guests were making such an effort to be with us to celebrate, I wanted something extra special waiting for them at their hotel. I included custom coffee bags, custom tea bags, a bit of candy, water bottles and some information about the island they were staying on. Two days before our wedding my maid of honor and I actually went to 9 different hotels dropping off these little packages and we could tell that the hoteliers were touched by the sentiment and were looking forward to surprising our guests with them. 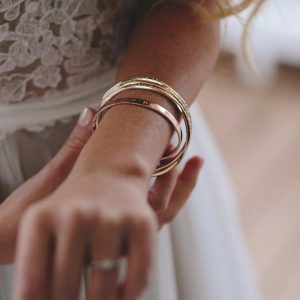 Some received them upon check-in and some were waiting for them in their rooms… and I’m not exaggerating when I say that every single guest mentioned how sweet they were. Mind you, this was 10 years ago before Pinterest and wedding blogs, so maybe they had never seen a hotel welcome gift before, but none the less it made me happy to make them feel special. 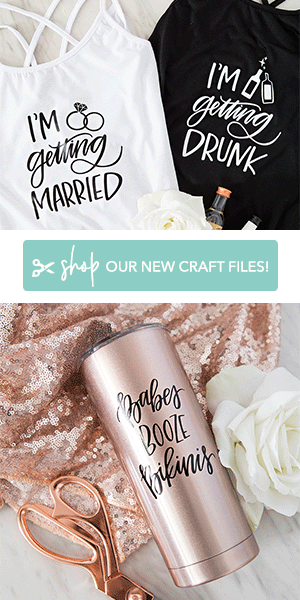 If you’re feeling like you want to do something special for out of town guests, guests that will be staying over, maybe just your bridal party or your entire guest list – I’ve created a simple formula that will make building your unique gift a total cinch! 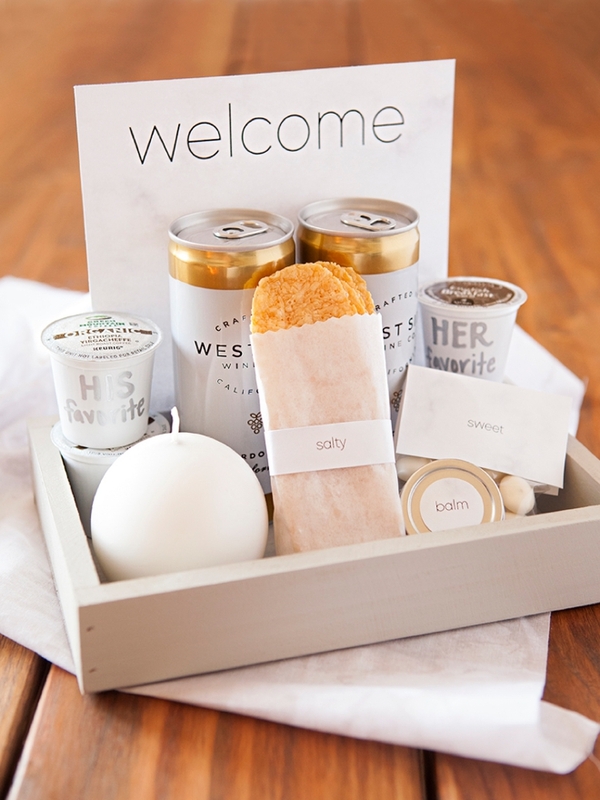 I’ve heard many brides say that building hotel welcome gifts can feel overwhelming and/or too expensive – but they don’t have to be. My #1 tip is to shop in bulk if you’re making a lot and don’t include items that you can’t buy in bulk. Between Costco, Etsy, Keurig and Amazon – you’ll be covered. Usable Item: sunscreen – ideal for the beach! See how easy that was to break down by theme + items! The past 4 out of 5 hotels I’ve stayed in this year have all had single serve Keurig® brewers… and I wish I would have known because I would have brought my favorite brew with me! 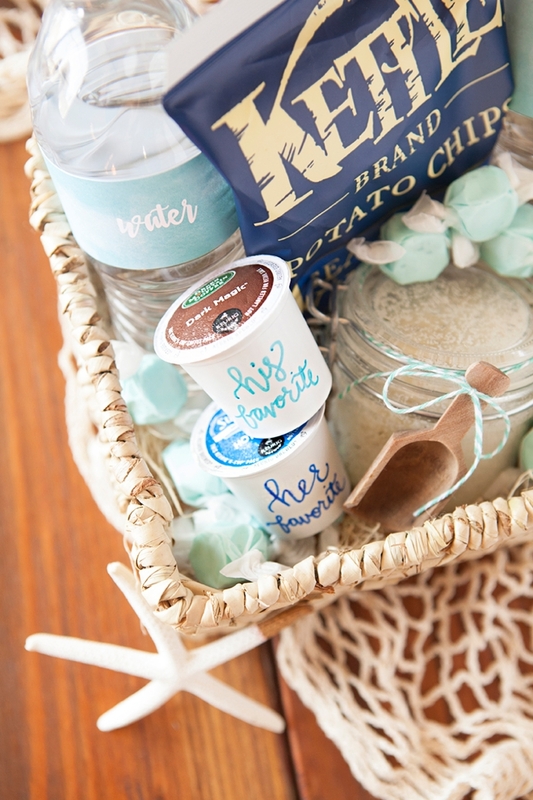 As the bride and groom, when you’re recommending hotels for your guests to stay in, if they have Keurig® brewers – you absolutely must include your favorite K-Cup® pods in your welcome gift! Keurig brewers offer endless possibilities for quality coffee, tea, hot cocoa and more, just the way you like it, at the touch of a button. For instance, there are more than 50 distinct varieties of Green Mountain Coffee® beverages, each infused with the top 10% of coffee beans in the world! 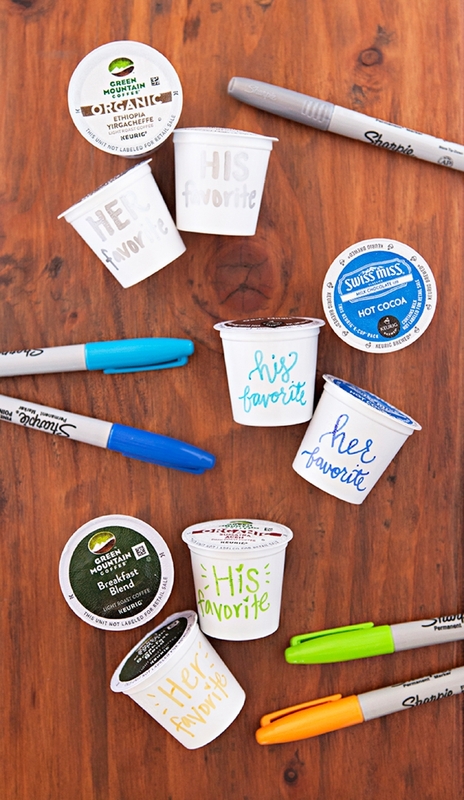 Take the personalization a step further (which you know I love) and include his + hers favorite brews – use a Sharpie to mark whose is whose. 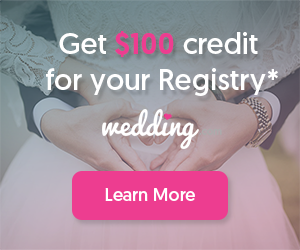 Your guests will absolutely love it! 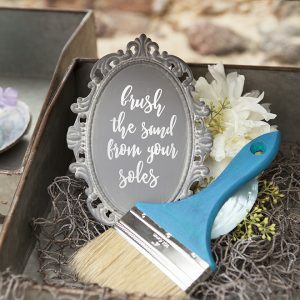 ***In all these boxes I repackaged bulk supplies into smaller servings and made my own labels… which I highly recommend! 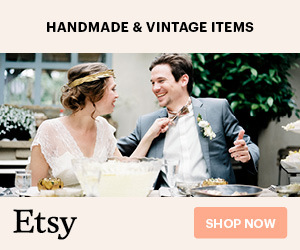 Organic, bohemian weddings are a huge trend right now and so of course I had to embrace that style too! 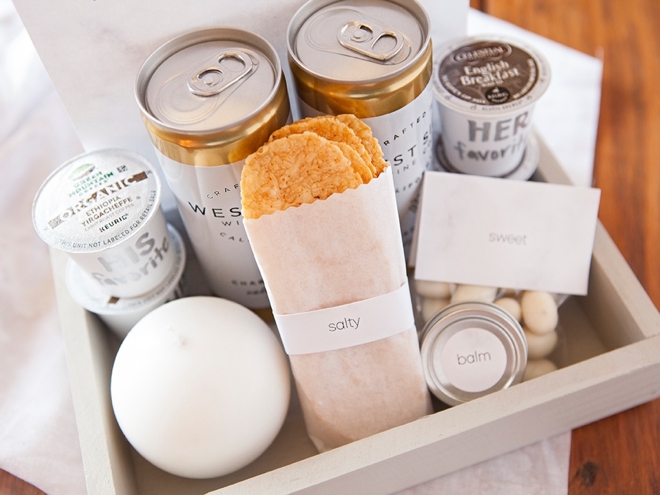 I hope that you’ve been inspired to take your hotel welcome gift to the next level and really make it personal! 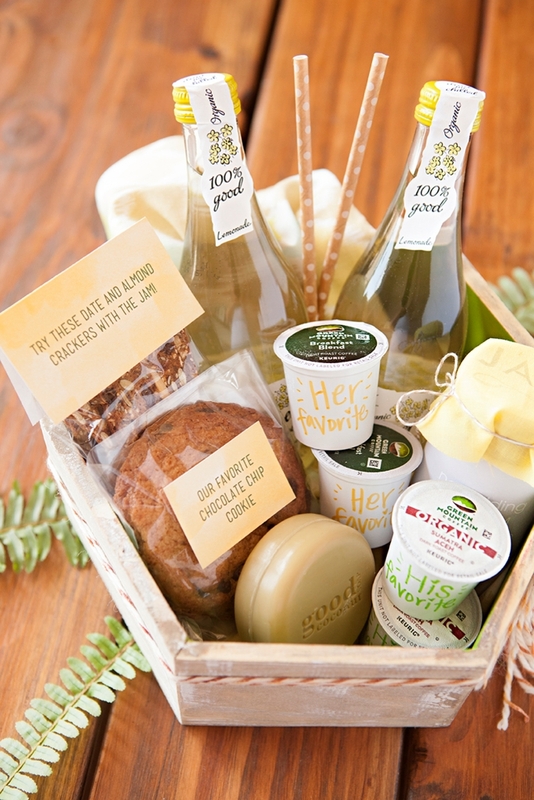 If you love our hotel welcome gift inspiration, you can follow along with this unique sponsored story in the coming weeks on these other fabulous Aisle Society blogs: visit Fab You Bliss to see a super creative proposal, a darling tea + coffee Bridal Shower on Chic Vintage Brides, stop by Burnett’s Boards for an adorable reception coffee bar towards the end of August, and some sweet honeymoon inspiration on Knotsvilla in the middle of September!